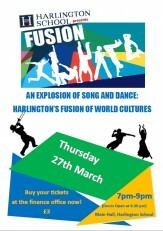 Harlington School is delighted to announce Fusion, an explosion of song and dance: Harlington’s fusion of world cultures. Doors will open at 6.30pm on Thursday 27th March. Planning is in its advanced stages. Our pupils many creative and organisational talents are being marshalled by an energetic and enthusiastic team of Sixth Formers, co-ordinated by Mr Jefferies, Head of Sixth. Tickets will be available from the Finance Office at the School at £3/head. Food is included. Further details TBA when tickets become available.